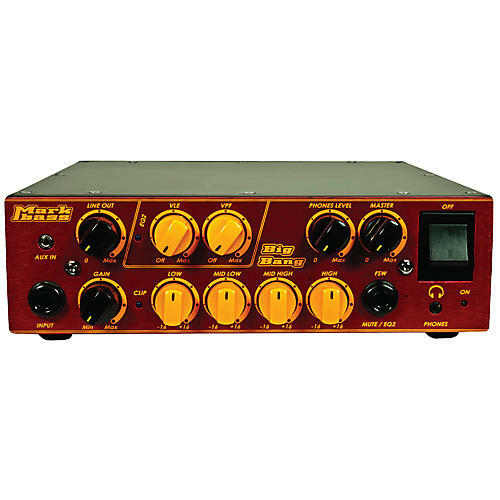 An amp head even smaller than the Little Mark with 500W of power and newly added extras. Now, you'll be amazed that such a warm, rich and "explosive" sound comes from an amp smaller than Markbass' groundbreaking Little Mark heads! And-despite its small size-the Big Bang is packed with extra features that players have been asking for: aux in, headphone output with level control, plus mute and VLE and VPF filters with footswitch control. Other features, already appreciated by Little Mark users, include a simple and effective 4-band EQ, effects loop, and level control and pre/post EQ switch for the XLR DI output. Massive power you can almost fit in your pocket. Order today! Dimensions (W x H x D): 8.94" x 2.56" x 10.04"